William Avery believes in the East India Company, which rules most of that immense land in 1837, but he knows the company doesn’t believe in him. A lowly ensign in Calcutta, Avery has little chance of promotion, but maybe that’s just as well, since he can’t stand India, which he considers savage. He would as soon resign his position and return to England, but he has no prospects there, either, and no money to pay the fare. 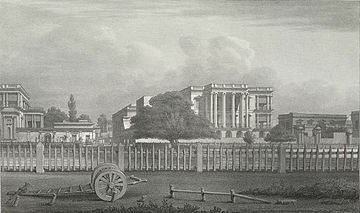 General Post Office, Calcutta, 1833 (Courtesy Wikiwand). His last chance to make a name for himself comes in poisonous form, to second James Blake on a secret mission deep up-country. Avery rightly suspects that he’s unlikely to survive, which may be his superiors’ intention. Moreover, he can’t stand Blake, an extremely unpleasant, older man who threw away a promising career with the company and adopted indigenous ways. But all that takes second place when Avery’s only friend is murdered and his name slandered as a drunken, lecherous, debt-ridden schemer. With barely time to grieve, Avery must take his journey to what he thinks will be oblivion. The road was not yet as busy as it would become once the rains stopped for good, but it was already a full day’s entertainment in itself. There were frenzied ash-smeared fakirs who gamboled grotesquely and stuck their palms out for money; women wrapped in layers of cottons–saffron, pink, blue–with babes on their hips and dull brass bracelets tinkling; small insolent boys chewing sugarcane. There were jugglers with families of monkeys in their turbans; wealthy Sikhs in yellow silk waistcoats with enormous beards and huge dastars [headgear], leading columns of camels and carts; wedding parties in red and silver, with painted elephants, encircled by the scent of jasmine; and carts of dull-eyed, ragged indentured servants. More profoundly, Avery realizes that Blake, though stubbornly difficult, has put his keen observational and linguistic skills to serve a moral code, and that the older man has much to teach. Avery struggles mightily with the challenges to his certainty. Even so, he comes to similar conclusions: that the company has betrayed English ideals in pursuit of profit, and that whatever benefits it has brought have dearly cost the populace. Most particularly, the company has perpetuated myths about violent bandits to excuse military operations that expand the area under its control. Consequently, the company has created a monster that only it can slay, a corruption that will doom it in the long run (as would, in fact, happen twenty years later). What an absorbing, provocative tale this is, remarkably well told for a first novel, and vivid in attitudes and scenery. I like Carter’s characterizations of Avery and Blake–the callow traditionalist versus the jaded radical–and many people they meet have their own complexities. I question, though, how quickly Avery loses any thought of his late friend, much maligned, only to have the death wrapped up just as quickly at the end. Further, Blake’s absolute silence about every conceivable detail seems too convenient. True, he doesn’t trust Avery’s judgment, but Blake carries this so far as to make me think it’s an authorial ploy to keep the reader guessing, a drawback of using a first-person narrative. Finally, since Avery is a crack shot, his sole visible talent, you can be sure that will come into play, which occasionally tips off where the narrative will go. That said, The Strangler Vine has much going for it, not least its resonance with current issues. The East India Company, as Carter shows, provides an early example of corporate governance and the abuses that entails. Substitute terrorist for bandit, and the novel also offers a nineteenth-century take on an up-to-the-minute controversy. Did bandits exist in India? Yes. Were they as widespread and dangerous as the company claimed, and did their presence justify its policies? Those are the questions, then and now.